Web Scrapers are tools designed to extract / gather data in a website via crawling engine usually made in Java, Python, Ruby and other programming languages. Web Scrapers are also called as Web Data Extractors, Data Harvesters , Crawlers most of which are web-based or can be installed in local desktops. Buy the Web Scraping Secrets Exposed ebook. This ebook is 165 pages long and written by Jon Donetello, who’s spent years web scraping for profit. Web scraping software enable webmasters, bloggers, journalist and virtual assistants to harvest data from a certain website whether text, numbers, contact details and images in a structured way which cannot be done easily through manually copying and pasting due to the large amount of data that needs to be scraped. Typically it transforms the unstructured data on the web, from HTML format into a structured data stored in a local database or spreadsheet. 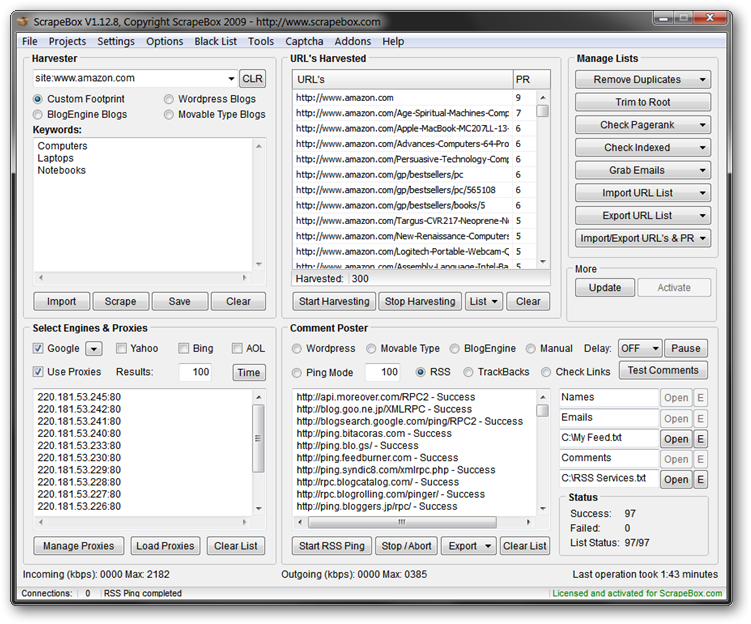 Content Grabber is an enterprise-level web scraping tool. It is extremely easy to use, scalable and incredibly powerful. It has all the features you find in the best tools, plus much more. It really is the next evolution in web scraping technology. Content Grabber can handle the difficult sites that other tools fail to extract data from. Content Grabber includes web crawler functionality, built in integration with Google Docs, Google Sheets and Drop Box and the ability to extract data to almost any database including direct to custom data structures. The visual editor has a simple point & click interface. It automatically detects and configures the required commands, facilitating decreased development effort and improved agent quality. Centralized management tools are included for scheduling, database connections, proxies, notifications and script libraries. The dedicated web API makes it easy to run agents and process extracted data on any website. There’s also a sophisticated API for integration with 3rd party software.It enables you to produce stand-alone web scraping agents which you can market and sell as your own royalty free. Content Grabber is the only web scraping software scraping.pro gives 5 out of 5 stars on their Web Scraper Test Drive evaluations. You can own Content Grabber outright or take out a monthly subscription. HarvestMan is a web crawler application written in the Python programming language. HarvestMan can be used to download files from websites, according to a number of user-specified rules. The latest version of HarvestMan supports as much as 60 plus customization options. HarvestMan is a console (command-line) application. HarvestMan is the only open source, multithreaded web-crawler program written in the Python language. HarvestMan is released under the GNU General Public License.Like Scrapy, HarvestMan is truly flexible however, your first installation would not be easy. Using a minimal programming you will be able to extract anything. Off course, you can also request a private scraper if there’s an exclusive in there you want to protect. In other words, it’s a marketplace for data scraping. Scraperwiki is a site that encourages programmers, journalists and anyone else to take online information and turn it into legitimate datasets. It’s a great resource for learning how to do your own “real” scrapes using Ruby, Python or PHP. But it’s also a good way to cheat the system a little bit. You can search the existing scrapes to see if your target website has already been done. But there’s another cool feature where you can request new scrapers be built. All in all, a fantastic tool for learning more about scraping and getting the desired results while sharpening your own skills. Best use: Request help with a scrape, or find a similar scrape to adapt for your purposes. Is an online web scraper available for commercial use. Provides easy content extraction using Full-Text RSS tool which can identify and extract web content (news articles, blog posts, Wikipedia entries, and more) and return it in an easy to parse format. Advantages; speedy article extraction, Multi-page support, has a Autodetection and you can deploy on the cloud server without database required. Produced by Kimono labs this tool lets you convert data to into apis for automated export. Benjamin Spiegel did a great Youmoz post on how to build a custom ranking tool with Kimono, well worth checking out! kimono: a 60 second introduction from Kimono Labs on Vimeo. This is a unique tool for web data extraction or web scarping.Designed for easiest and fastest way of getting data from the web for everyone. It has a point & click interface and with the power of the cloud you can scrape, store, and manage your data all with Mozenda’s incredible back-end hardware. More advance, you can automate your data extraction leaving without a trace using Mozenda’s anonymous proxy feature that could rotate tons of IP’s . Need that data on a schedule? Every day? Each hour? Mozenda takes the hassle out of automating and publishing extracted data. Tell Mozenda what data you want once, and then get it however frequently you need it. Plus it allows advanced programming using REST API the user can connect directly Mozenda account. Mozenda’s Data Mining Software is packed full of useful applications especially for sales people. You can do things such as “lead generation, forecasting, acquiring information for establishing budgets, competitor pricing analysis. This software is a great companion for marketing plan & sales plan creating. Using Refine Capture tetx tool, Mozenda is smart enough to filter the text you want stays clean or get the specific text or split them into pieces. 80 legs offers customized web crawling that lets you get very specific about your crawling parameters, which tell 80legs what web pages you want to crawl and what data to collect from those web pages and also the general web crawling which can collect data like web page content, outgoing links and other data. Large web crawls take advantage of 80legs’ ability to run massively parallel crawls. Using thousands of rotating proxies you will be able to sneak on the competitor’s site keywords, do research on .gov sites, harvesting data, and commenting without getting blocked. The latest updates allow the users to spin comments and anchor text to avoid getting detected by search engines. When a website changes layout or your web scraper stops working, scrape.it will fix it automatically so that you can continue to receive data uninterrupted and without the need for you to recreate or edit it yourself. They work with enterprises using our own tool that we built to deliver fully managed solutions for competitive pricing analysis, business intelligence, market research, lead generation, process automation and compliance & risk management requirements. Off course the list would not be cool without Scrapy, it is a fast high-level screen scraping and web crawling framework, used to crawl websites and extract structured data from their pages. It can be used for a wide range of purposes, from data mining to monitoring and automated testing. · Design with simplicity- Just writes the rules to extract the data from web pages and let Scrapy crawl the entire web site. It can crawl 500 retailers’ sites daily. · Scrapy comes with lots of functionality built in. Many organizations, from private companies to government agencies, store their info in a searchable database that requires you navigate a list page listing results, and a detail page with more information about each result. Grabbing all this information could result in thousands of clicks, but as long as it fits the same formula, Needlebase can do it for you. 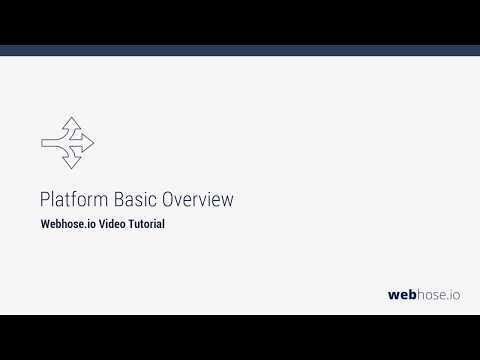 Point and click on example data from one page once to show Needlebase how your site is structured, and it will use that pattern to extract the information you’re looking for into a dataset. You can query the data through Needle’s site, or you can output it as a CSV or other file format of your choice. Needlebase can also rerun your scraper every day to continuously update your dataset. This Firefox extension is one of the more robust free products that exists Write your own formula to help it find information you’re looking for, or just tell it to download all the PDFs listed on a given page. It will suggest certain pieces of information it can extract easily, but it’s flexible enough for you to be very specific in directing it. The documentation for Outwit is especially well written, they even have a number of tutorials for what you might be looking to do. So if you can’t easily figure out how to accomplish what you want, investing a little time to push it further can go a long way. In the address bar, type the URL of the Website. 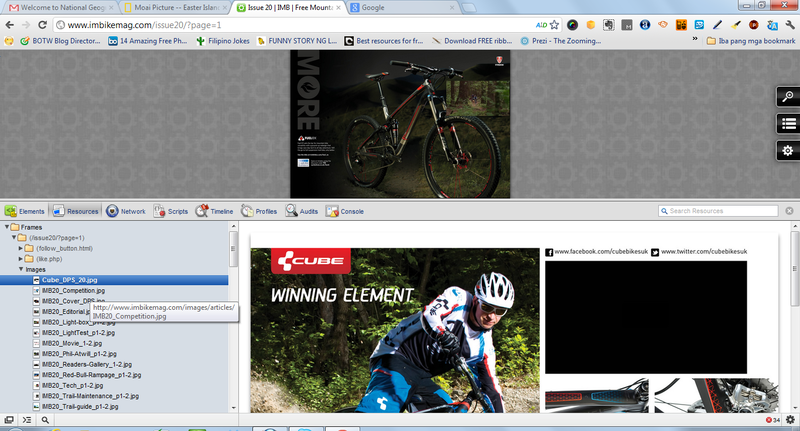 Go to the Page view where you can see the Web page as it would appear in a traditional browser. In the “Links” widget, OutWit Hub displays all the links from the current page. If you want to export results to Excel, just select all links using ctrl/cmd + A, then copy using ctrl/cmd + C and paste it in Excel (ctrl/cmd + V). This is a free program that is essentially a GUI for web scraping. There’s a pretty steep learning curve to figure out how to work it, and the documentation appears to reference an old version of the software. It’s the latest in a long tradition of tools that lets a user click through the logic of web scraping. Generally, these are a good way to wrap your head around the moving parts of a scrape, but the products have drawbacks of their own that makes them little easier than doing the same thing with scripts. Best use: Slightly complex scrapes involving multiple layers. The same ethos on how microsoft macros works, iMacros automates repetitive task.Whether you choose the website, Firefox extension, or Internet Explorer add-on flavor of this tool, it can automate navigating through the structure of a website to get to the piece of info you care about. 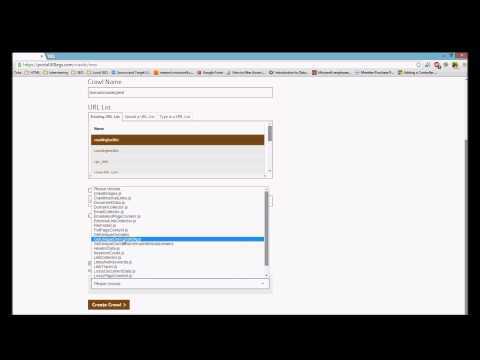 Record your actions once, navigating to a specific page, and entering a search term or username where appropriate. Especially useful for navigating to a specific stock you care about, or campaign contribution data that’s mired deep in an agency website and lacks a unique Web address. Extract that key piece (pieces) of info into a usable form. Can also help convert Web tables into usable data, but OutwitHub is really more suited to that purpose. Helpful video and text tutorials enable you to get up to speed quickly. Best use: Eliminate repetition in navigating to a particular datapoint in a website that you’re checking up on often by recording a repeatable action that pulls the datapoint out of the clutter it’s naturally surrounded by. This is a neat little web service that generates all sorts of information given a list of urls. Currently, it only works for YouTube video pages, YouTube user profile pages, Wikipedia entries, Huffingtonpost posts, Blogcatalog blog posts and The Heritage Foundation blog (The Foundry). Given a url, the tool will return structured information including title, tags, view count, comments and so on. A browser-based web scraper works like Firefox’s Outwit Hub, it’s designed for plain text extraction from any online pages and export to spreadsheets via Google docs. Google Web Scraper can be downloaded as an extension and you can install it in your Chrome browser without seconds. To use it: highlight a part of the webpage you’d like to scrape, right-click and choose “Scrape similar…”. Anything that’s similar to what you highlighted will be rendered in a table ready for export, compatible with Google Docs™. The latest version still had some bugs on spreadsheets. Cons: It doesn’t work for images and sometimes it can’t perform well on huge volume of text but it’s easy and fast to use. The main purpose of Google Inspect Elements is for debugging like the Firefox Firebug however, if you’re flexible you can use this tool also for harvesting images in a website. Your main goal is to get the specific images like web backgrounds, buttons, banners, header images and product images which is very useful for web designers. The Webhose free plan will give you 1000 free request per month which is pretty decent. Webhose lets you use their APIs to pull in data from a huge amount of different sources, perfect if you are searching for mentions. The software is a good if you are looking to scrape lots of different sites of specific terms, opposed to scraping specific sites. Expired content is old content from expired domains that are no longer indexed. Millions of articles sit in Waybackmachine waiting to be scraped and used on your PBNs. This can be done manually once you have found good expired domains with quality content, but a dedicated content web scaper will make your life much easier! Hi. Great article. Have you checked also this one: http://www.uipath.com/automate/web-scraping-software ? Thanks for including import.io in your list. Give us a shout if you want to flesh out our entry a little bit… you could include our tutorial videos, our enterprise service and loads of other cool stuff. You can try our software FMiner(http://www.fminer.com/), it’s a web scraping software with a macro recorder. Selenium is one of the best tool to web scrape. Thanks for sharing this useful tool with us. You know that many websites collect your personal information without your permission and without you even knowing it. By using this tools we can easily avoid web scraping. Hey, Datahut (http://datahut.co/) is also working the web data extraction domain. We’re a data as a service provider which basically means you get ready to use data without the need to write code or configuring a tool. These tools are helpful if you need to extract information from the search engine. Thanks for sharing this list,Gareth. Which ones will be best and cheapest solution for collecting large volumes of business leads from sites as Google, Yelp,Notcy,Yell,Mantra etc.? Great list of web scraping tools, Gareth! At PromptCloud, we have been working on building a web scraping service that overcomes the limitations of the DIY tools, maybe you can check it out too. Great list of web scrapping resources. I have used ‘Scraper’ one of the chrome extensions that helped me to extract web data in a different way either through link or title. However, now I have this great list of web scraping tools, it means more resources and better results. Thanks for sharing great information, this is so helpful for me!! Nice, thanks for sharing such kind of wonderful information. 3iDataScraping.com is also working the web data scraping domain. We’re a data as a service provider which basically means you get ready to use data without the need to write code or configuring a tool. Awesome list of scrapers, I have used imacros, althogh its little tough to setup on complex needs but once its done, it works very smoothly. I would like to suggest one more tool i.e. http://www.leadsjack.com I have used this tool for Google Maps data extraction. It works very beautifully. Apart from these Scrapebox is my all time favorite, it has many addons. At just one time fees these 2 tools may save lots of time and money. Nice tips you have here. I successfully scraped 5,000 Emails from the web. Great job, Gareth. There is another cloud web scraping service available: Diggernaut. Hope you can include it to your next review. Thanks. Seems like quite a comprehensive report. Thanks for sharing. Will definitely take some into consideration. 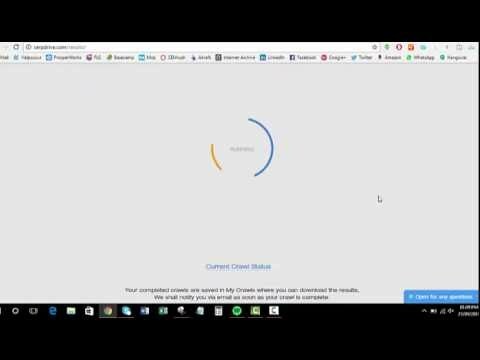 I am creating any kind of automation programs scrapers ,accountCreators, webBots, basicly any kind of custom bot u can imagine! If u are interested please checkout my Offer on Fiverr and get your desired bot done by a professional!! Thank you for sharing this article. It is very useful as it gives different views on each of the tools. We have used Content Grabber, which worked very well. Also, we are using Visual Web Ripper and c# scripts. Also, we are providing scraping services: http://webdata-scraping.com/. Great. Without developing code, I also think that ScrapeStorm(http://www.scrapestorm.com/) is a good tool to help people scrape datas easily. Good list of web scraping / data extraction tools, Gareth. Another good one to check out is Connotate – while their enterprise offering (https://www.connotate.com/data-extraction-platform/deployment-options/cloud-deployment/) is trusted by data centric organizations, they also have a nice offering for small teams or individual users to experiment with self-service web scraping and ad hoc data grabs (connotate express) from websites. And it’s pretty easy to use. thanks for the comprehensive list! What’s the typical use-case for you? Scraping Google SERP? Facebook? Or any other? We love to hear your comments on APIFY platform with provides not only scraping but also web automation. With specific “apps” we go different way where you can choose in our Library https://www.apify.com/library and start immediately working on your use-case. The basic use is for free and we can handle Captcha or blocking with rotating proxies. I will leave my contact here and can’t wait to your response.